Patch testing is a process to detect allergic contact dermatitis to something a person has contacted at home, leisure or at work. 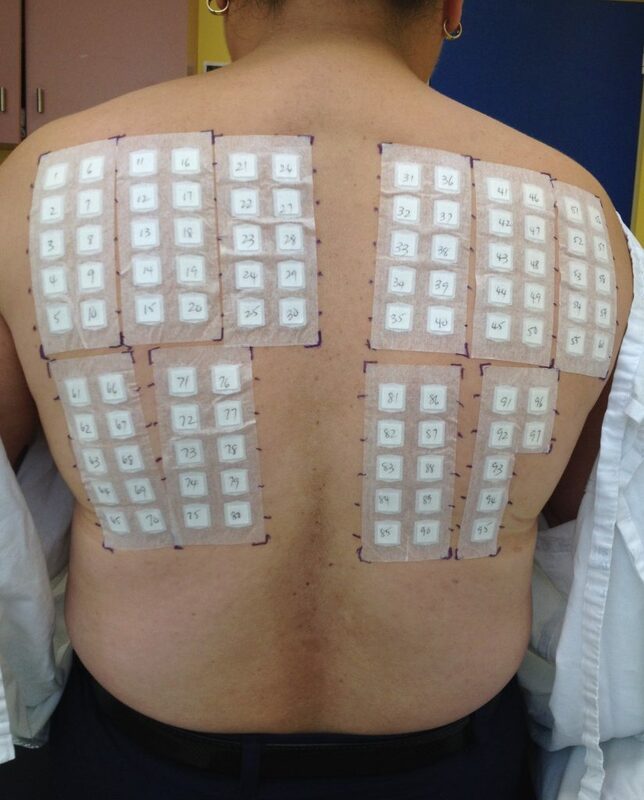 It involves applying patches with test substances in small chambers or discs to a person’s back. The patches are secured with hypoallergenic tapes. No needle pricking is involved. Patch testing does not test for urticarial (hives) or food allergy. Is patch testing the same as prick testing? Patch testing is not the same as prick testing. 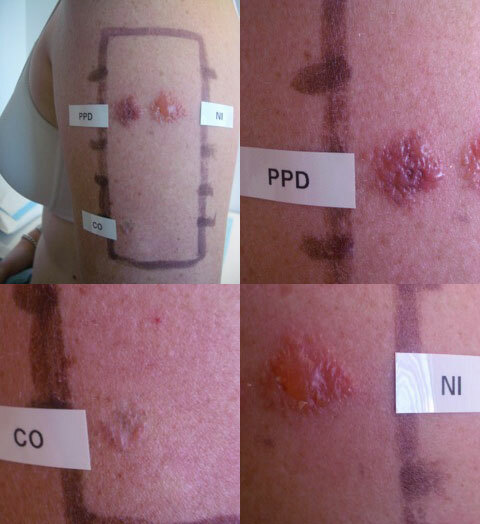 Patch testing is used to detect allergic contact dermatitis (type IV hypersensitivity reaction). This includes allergy to hair dye, shoes, active ingredients, preservative and fragrances in sunscreens, cosmetics and medicaments. The allergic reactions usually appear 2 to 4 days after applying the allergen on the skin but it can take up to a week to react. Prick testing on the other hand is used to test type I allergy causing hay fever, asthma and contact urticaria (hives). Prick testing involves needle pricking and is read 20 minutes after skin pricking. The allergens applied are tailored to the individual. A standard baseline series of allergens is applied, together with other specific allergens relevant to the individual. Examples of substances that can cause allergic contact dermatitis are nickel, fragrances, preservatives such as methylisothiazolinone, and hair dyes. What is involved in getting a patch test? The first step is to obtain a referral to a dermatologist who performs patch testing. 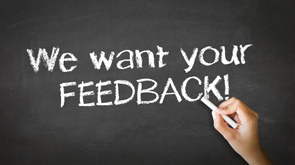 During the initial consultation, information is obtained to identify possible allergens. It is important to bring along anything that has been in contact with the skin including cosmetics, moisturisers, gloves, shoes, work samples and material safety data sheets, if these are relevant. Appointment 1 (Monday): Patches are applied and kept undisturbed for 48 hours. Appointment 2 (Wednesday): Patches are removed, reactions read and test sites marked with suitable maker. Appointment 3 (Friday): Second reading done and results and management discussed with the dermatologist. Some people may require a late reading at day 7 to 10. The process described above may vary between different patch test centres. It is best to ask the treating dermatologist for specific details. It is possible to become allergic to something that has been used for many years. If in doubt, bring along everything to show the dermatologist. Avoid direct sunlight exposure to the back several days prior and for the duration of testing as UV radiation may reduce the immune response in the skin. Keep the area of skin being tested dry until the final reading. Avoid activities that make you hot and sweaty. Avoid excessive twisting movement which can lift the test patches. Do not apply any oil or cream on your back the morning of the testing. If you are taking cortisone/prednisolone or immunosuppressive medications, please check with your dermatologist as they can affect the result of patch testing. What problems may be associated with patch testing? A positive patch test reaction will produce active dermatitis in the area of application. This will be itchy and usually requires treatment with a topical steroid. Sometimes the original rash may be reactivated and the dermatitis may become widespread. In people with darker skin the reactions may persist as dark patches for many weeks/months. Although hypoallergenic tape is used, some people can still react to areas in contact with the tape. An “angry back” reaction may occur, especially in a person with active dermatitis at the time of testing or in someone who has multiple strong positive reactions. In this situation, it is difficult to interpret the positive reactions as some or all of these may be false positive reactions. Therefore it is important to settle active dermatitis before undergoing patch testing. Where is patch testing performed? Please check with your local dermatologist.